Great news jailbreakers! 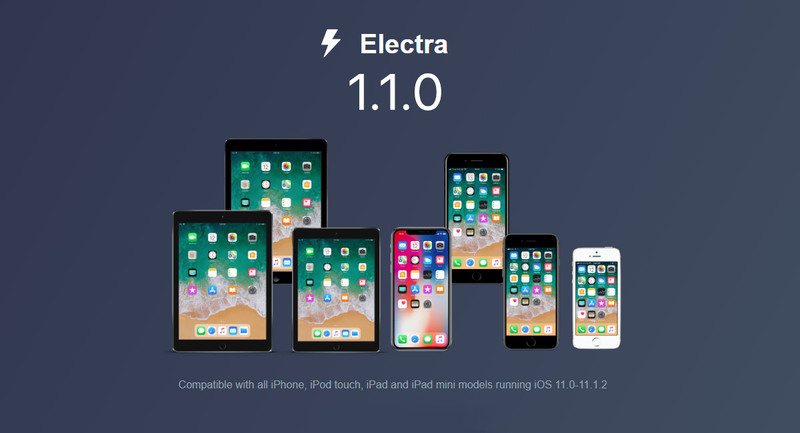 The team behind the extremely popular Electra jailbreak tool has released version 1.1.0 of the IPA file. This latest offering continues to offer compatibility for iPhone and iPad hardware running iOS 11.0 through iOS 11.4 beta 3. The Electra jailbreak tool has been out in the wild for quite some time now and has long been the package that jailbreakers have turned to for device liberation. In fact, until Unc0ver was released, Electra was the only jailbreak that actually offered device liberation all the way up to iOS 11.4 beta 3. A lot of iPhone and iPad owners have recently opted for the Unc0ver option thanks to the perception that it offers a little more than Electra but for those who have stayed with @CoolStar‘s offering, this latest 1.1.0 release looks to improve stability and take the jailbreak to the next level. One of the great things about version 1.1.0 is that it has actually been tested over a prolonged 4-month period, meaning that there should be no huge surprises in terms of major bugs when it is installed. In terms of what is being offered, the team has highlighted improved VFS reliability, the overall stability of the jailbreak, and internal updates for APT and DPKG. In short, thanks to the internal updates and the prolonged testing, anyone jailbreaking with Electra 1.1.0 should have a much-improved experience with a more stable device as a result. One of the biggest benefits of this update is that all freezing issues should have hopefully been rectified. This latest version also works for any iPhone or iPad owner who has already jailbroken their device using an earlier version of the Electra jailbreak. Device owners simply need to sideload the latest 1.1.0 IPA fie using Cydia Impactor and then run the jailbreak to re-jailbreak their device with the latest more stable version. Of course, like all versions that have come before it, this 1.1.0 release is still a semi-tethered solution, which means that it will need to run every time the device is turned off or rebooted. This isn’t the jailbreak news that some people were hoping for as we approach the end of 2018. However, in lieu of any real progress as far as iOS 12 is concerned, this release will definitely provide some solace. As with all releases, a few untended bugs are expected, and this one is no exception. An issue with jailbreaking iOS 11 though iOS 11.1.2 appeared shortly after release but was quickly quashed via another update numbered 1.1.0-2. 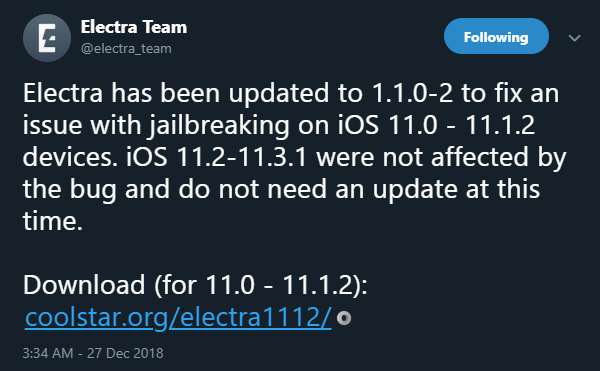 The latest version can be downloaded from coolstar.org/electra1112. Not bad. Get kinda sick of having to run Electra 10 times for it to jailbreak sometimes. does NOT work for 11.4 b3 just FYI. There are security holes in everything.